Is Michael O’Leary, the master of free press publicity, running scared? At a media briefing in London last week, he categorically stated that come Spring 2019 there would be no flights between the United Kingdom and the then 27 remaining nations of the European Union. Does he honestly believe that? BTN thinks not. A deal will be done under Brexit. It suits both sides. It’s good stuff for the tabloids on which he thrives. He is not a fan of transport secretary Chris Grayling. With O'Leary, there are truths, half-truths and downright lies. He was around before Trump. Is he going to base crew in Pardubice (Czech Republic) for the new winter route from Stansted in order for them not to come under UK rules? BTN thinks not. Nor Oradea (Romania) or Bydgoszez (Poland) with a planned Luton link. Why invest in these outposts if the route is to close in under two years’ time? EasyJet came in for criticism too, and for that matter Austria. To paraphrase delicately what he said, how could the tiny Vienna civil aviation authority cope with such paperwork? Did he deliberately forget that that Austria has a population of 8.47m (2016 census) as against Ireland’s 4.77m (2016 again)? British Airways was not to escape his censure either. According to O'Leary, Willie Walsh will have to dispose of Iberia/Vueling to Air France (now there’s a thought), but no mention of Aer Lingus. And as for Air Berlin and Lufthansa, any deal was “a complete stitch up”. Yes he was still interested in Alitalia with Ryanair big in Italy, claiming that management jobs would have to go, 160 staff at Ryanair’s Dublin HQ against Alitalia’s 1,600. “What do they do all day?” he said. O’Leary opened the proceedings with a demand that passengers should not be sold more than two alcoholic drinks before boarding, a commendable suggestion but very difficult to administer. Aircrew have the right to deny boarding of those thought not fit to travel. A high-profile turn-away might just have the effect on others who are considering being a little more than jolly. Ryanair has not changed its spots on that one, only last week a passenger offloaded because her carry-on bag was deemed a few mm oversize, after she had happily travelled on the outbound leg with another carrier. 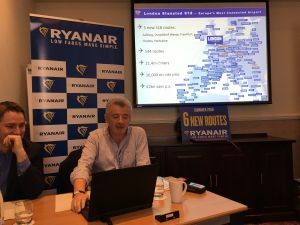 Ryanair announced six new routes out of London, those noted above plus Stansted to Aalborg, Frankfurt and Weeze and O'Leary said that while it took Ryanair 33 years to fly one billion passengers (celebrated in July), the next one billion will take just seven. Mr O'Leary speaks from his perspective of course. British registered carriers have 3rd and 4th freedoms to fly from their country of registration to another country and from that country back again. Ryanair, as an Irish registered carrier would revert to 5th freedom rights seeking to fly between two countries, neither of which is the country of aircraft registration. Life was fine for British carriers pre EU and we showed the world how low cost aviation should work for the consumer. BTN is absolutely correct. A deal will be done because it has to be done. No politician is going to risk his life for an ideal and that is what it is going to come to, and soon. As usual Mr O’Leary is making pronouncements for his own ends. The best thing BTN can do is to deny him the oxygen of publicity. Make it an O’Leary-free zone. You’ll gain more readers than you lose. Michael O\'Leary is one of the worlds most successful businessmen, and as such his opinions deserve our attention and respect. His comments are often \'playful\' but seldom far wide of the mark. Your correspondent completeldismisses O'Leary's comments on the impact of Brexit on UK Aviation and seems very confident that a deal will be done. David Davies and his colleagues would so far not give us any confidence in their ability to find solutions. In my view it is quite possible that the UK aviation industry could find itself in a difficult situation come the Brexit deadline of March 2019.